Fundamental mathematical skills are at the heart of 11 plus and Common Entrance exams, such as those set by the Centre for Evaluation and Monitoring (CEM), compiled by Durham University, and Granada Learning (GL), also known as NFER, and Independent Schools Examination Board (ISEB). The numerical reasoning section of these exams typically contains a combination of worded problems, requiring comprehension and manipulation of data; quick-fire questions, which are designed to test a child's raw mathematical ability; and mental arithmetic. 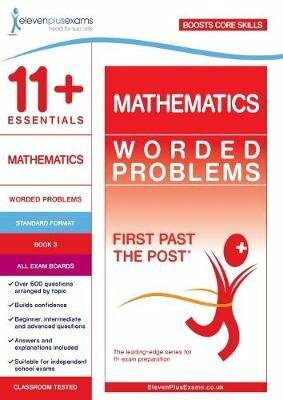 Mathematics: Worded Problems aims to develop the skills required to solve mathematical worded problems. This book comprises 14 chapters, each representing a key group of related topics, each divided into three levels of difficulty: easy, intermediate and advanced. Extensively road-tested by Eleven Plus Exams, all 11+ Essentials tests are best used as real exam practice to strengthen a child's performance. They are perfect for use both in the classroom and at home.